Michigan state parks, private campground, and RV information. Lake Michigan camping can be an enchanting, romantic and is just a plain fun experience you'll both enjoy. Whether you like roughing it in a tent or something more civilized such as a cabin, trailer, or RV, being together in "the wild" is a relationship rekindling experience. Imagine ... enjoying miles of Michigan beaches or hiking the many trails. Picture the two of you exploring during the day, then watching a romantic sunset before returning to the warmth of a fire. Snuggling together while roasting marshmallows. The two of you alone, spending quality time in unbelievable, majestic beauty. The sounds of the night against a moonlit and star filled sky is a memory you'll cherish forever. Spend time rediscovering each other all over again in Michigan's natural beauty. You may be lucky enough to experience the Northern lights. 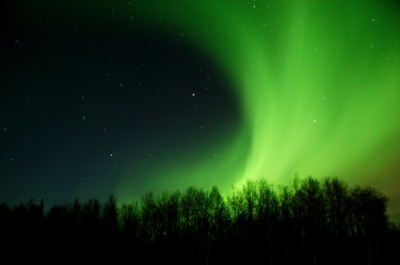 How cool would that be to see the Aurora Borealis? Sue and I in all our trips north have yet to time it right to experience the northern lights. My dream is to be at Sleeping Bear and view them from atop the giant dunes. Yup, that would be one special Lake Michigan camping trip. Come discover the romance of camping in Michigan! There are plenty of state parks that offer sites from wilderness to modern, with several also having cabins available. The always popular KOA parks are also located along the coast. Be sure and get the KOA Value Kard which will give you tons of related discounts and it's only $24 a year. Here is some helpful information to make your Michigan camping experience more enjoyable. Michigan state parks fees and rules you need to know. Click here for Michigan campgrounds listings. Find Michigan RV rental information. 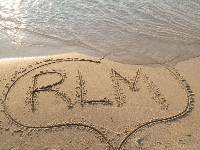 Click here to check out our Romantic Lake Michigan shirts and other items. Learn how to make your camping trip romantic! Pets are allowed as long as they are leashed. They are, however, not allowed on beaches or near swimming areas. Many parks are ADA compliant. Call ahead and check if you need these amenities. Unlike other vacations, camping requires more stuff. Taking the time to properly plan out your trip, and the items you will need, is the key to a memorable, romantic experience. If you travel the country visiting the many state parks, be sure to check out our friend Matt Coopers website American State Parks. From Lake Michigan camping back to Romantic lake Michigan home.